The incident happened at a Vodafone branch in Bunclody at 3pm on Saturday. 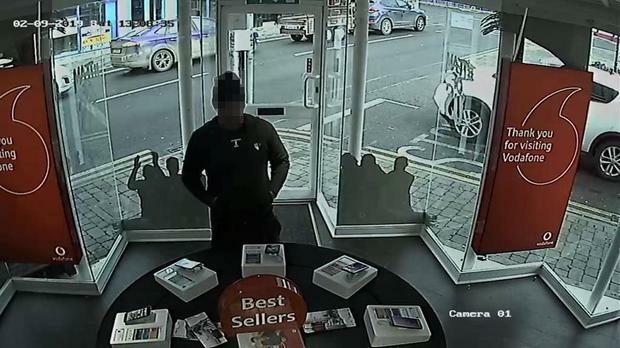 CCTV shows how one of the men initially entered the shop and appears to ask for assistance. Two other men can then be seen walking in and heading straight for the back room where a number of valuable phones were stored. They then appear to force the Vodafone employee into the storage room and made him open a number of safes. The trio escaped with three large bags of phones and some cash. They were seen fleeing the scene in a gold Skoda Octavia. 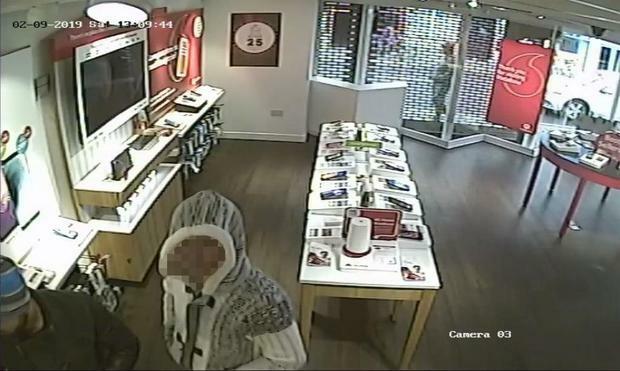 A Vodafone manager told Independent.ie that there was also an attempted robbery at a branch in Athy at around 11am on the same day. “Three guys were in our shop in Athy and they didn’t have any success as colleagues spotted something wasn’t right. “Then at 14.50pm in Bunclody the same thing happened. There were no guns or weapons used but they were very aggressive. “They took every phone and some money. Nobody was hurt, just shocked,” he added. CCTV still images obtained by the Herald show the scenes from both the Bunclody and Athy store incidents. The robbery also came just days after a raid at an Eir phone store on the main street of Wicklow town. It is understood gardaí apprehended a number of raiders following a chase which ended in Bawnogue, Co Dublin. It was the second time in five days that that particular store was raided. It is not known if any of the three incidents are linked. A Garda spokeswoman told Independent.ie no arrests have been made in relation to the Bunclody incident and investigations are ongoing. “Any witnesses or anyone who can assist Gardaí with information is asked to please contact Bunclody garda station on 053 – 9377102,” she added.